Submitted by Simon Coleman on Sun, 5 Apr 2015 - 09:31. Mr R. W. Weal was the tenant of plot 229 from 1946 until 1993 when his son Dennis Weal took over the plot. In the decades after WW2 a number of plot holders built their own wells as there was no mains water on the allotment until around 1995. 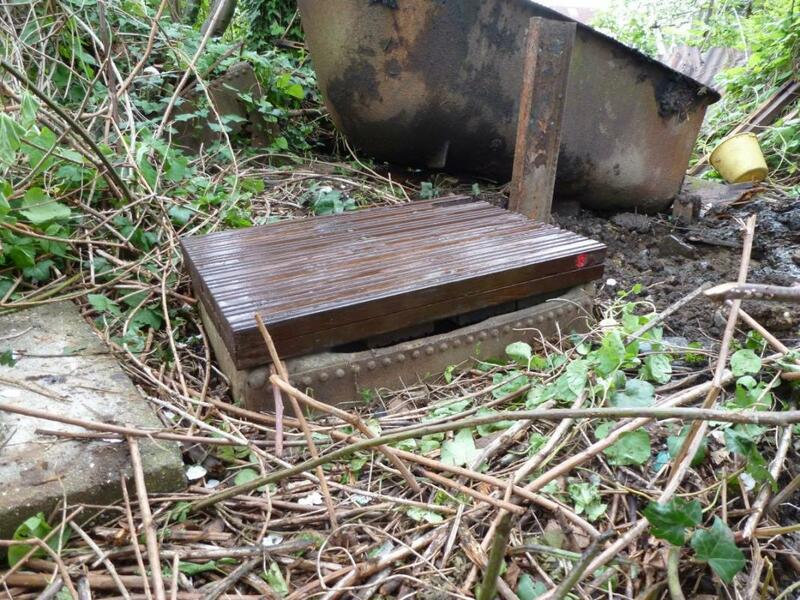 Mr R Weal dug his well which is constructed of metal water tanks placed on top of each other with the bottom cut out. He also installed a K4 Semi-Rotary pump to extract the water. His son Dennis told Christina Fox that they constructed a shed around the pump to stop people using it as the handle was broken by people using it. If you would like to see the shed it is now rebuilt in original design on plot 198. Dennis Weal took over his father plot in 1994, it has been remarked by long standing plot holders that it was one of the "best kept plots" in its heyday. When first opened the shed its was full of rubbish, plastic bags, bottles, hose pipe etc. In one corner we found the old pump. 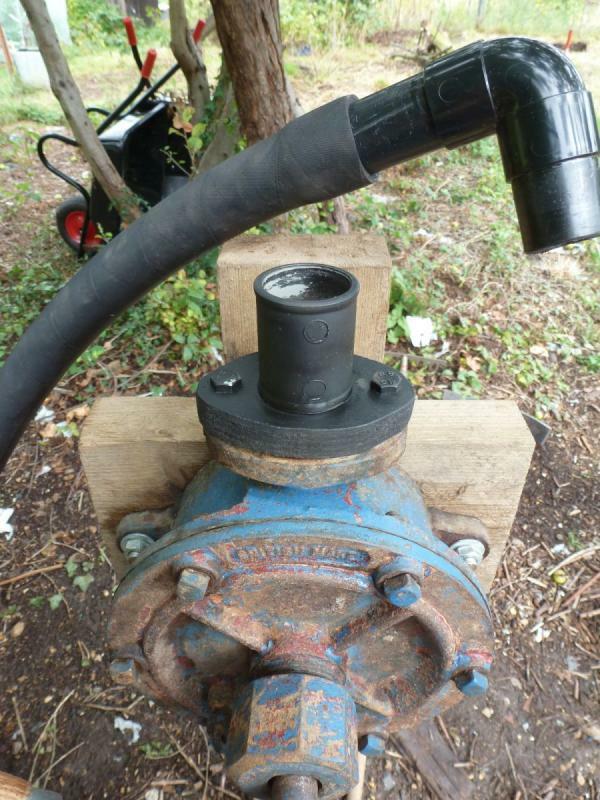 The pump is a British made K4 semi rotary pump, K4 refers to the size K1 being the smallest. 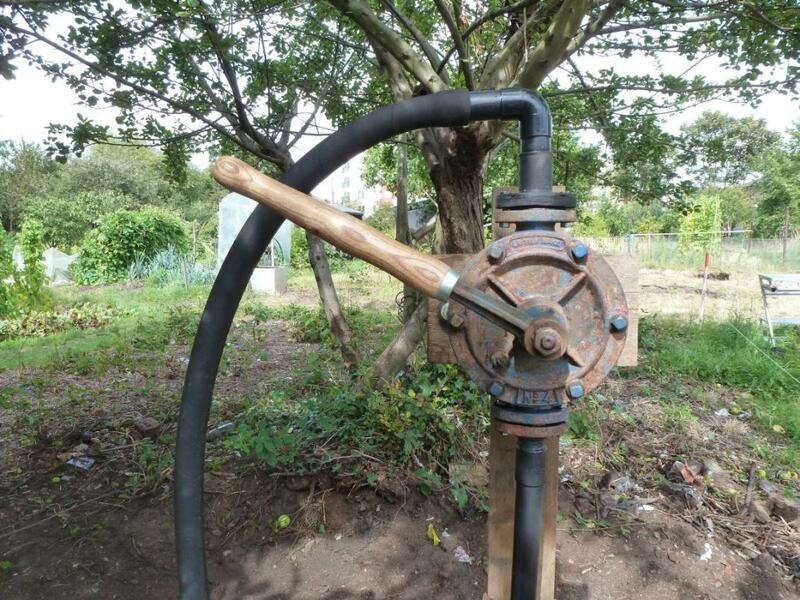 The image right is the pump in the shed, the top pipe work has two heads, One head has a car tyre inner tube tied with electrical cable, this is where the well water would come out. The other head has a screw cap where water was poured down to prime the pump. The wooden handle is missing but was found found in the shed. 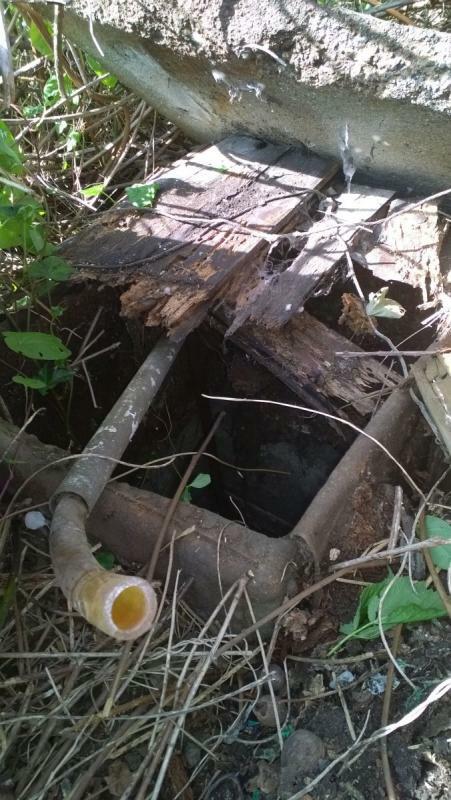 The photo far right is of the well top, some rotten wood can be seen with a plastic pipe coming out from the well. It is believed that this was not the original pipe that fed water to the pump but a later addition in the 1980's or 1990's. 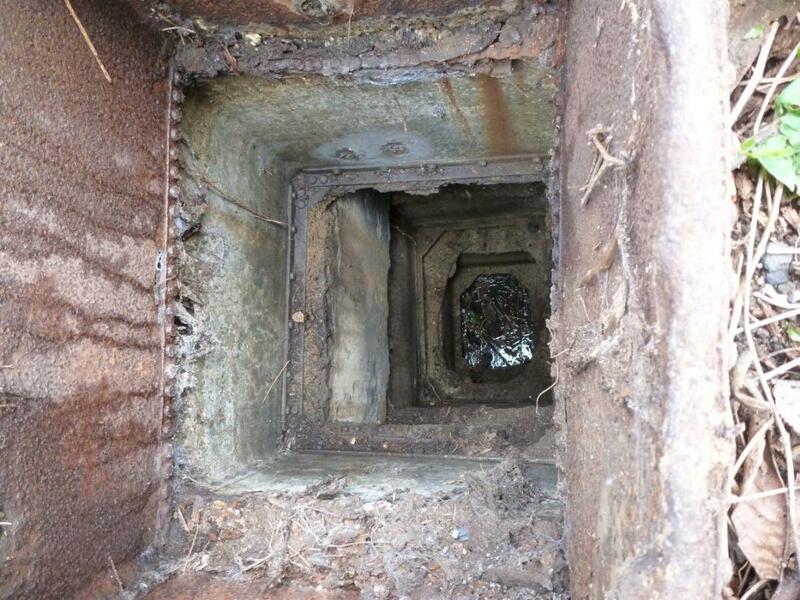 There is a larger metal pipe still visible in the bottom of the well which is believed to be part of the earlier pipe work. 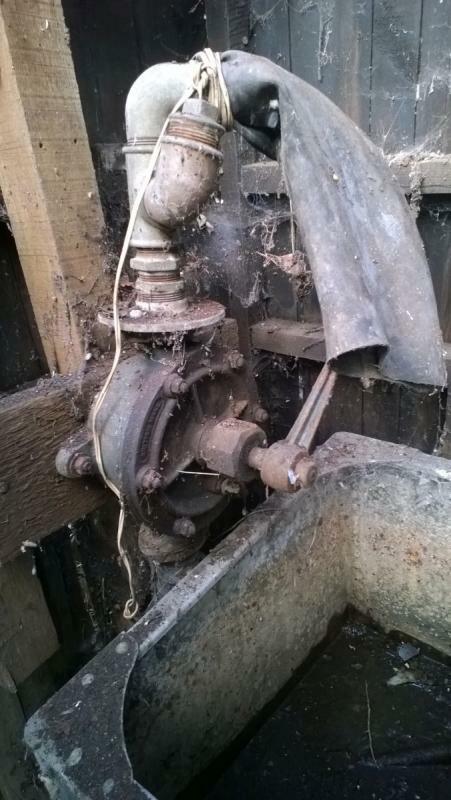 The next phase was to get the pump working again, One original seal fange was missing and various "bits and pieces" had been used to fit the pipe work together. 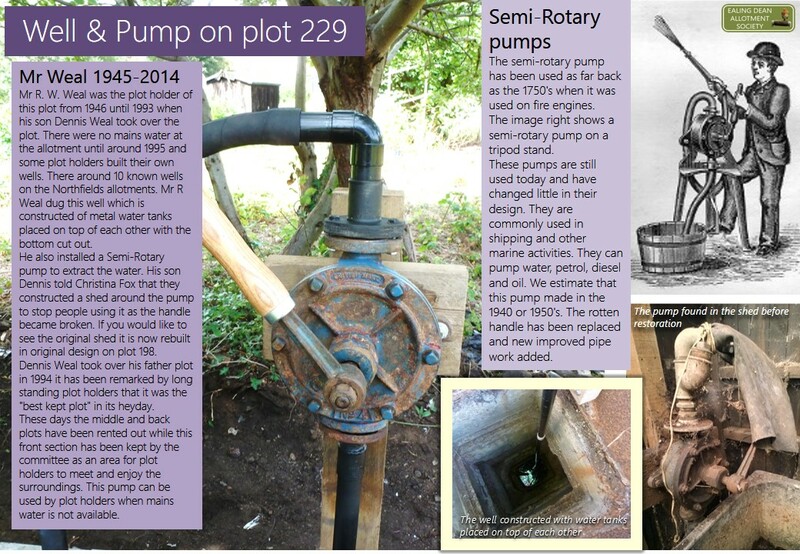 The images right shows the pump which at this point was still jammed and able to turn. Once the front bolts were removed the inernal working parts were visible. The moving parts are brass and have a series of small levers that force the water in and out. 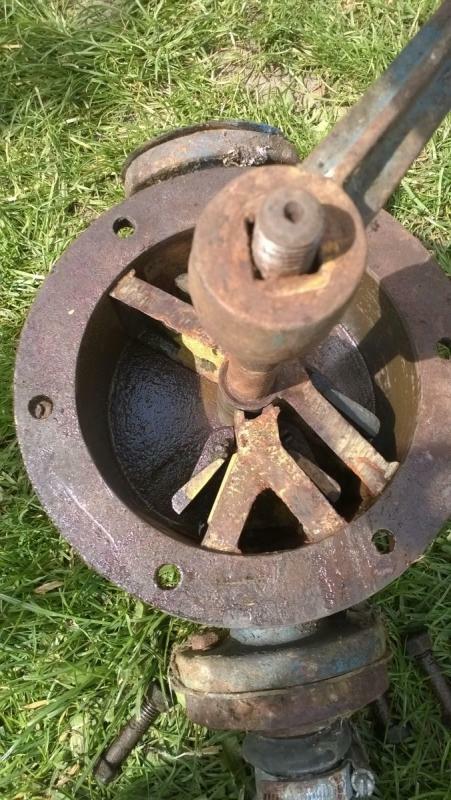 This is important area to remove any corrosion to make the pump work as well as possible. The images far right shows the internal sections of the pump. The well is constructed with old water tanks put one on top of the other. A new well top was constructed of wood and fitted on top. An old water tank was later then used on top as a dip tank to hold the pump water. The image right shows the internal well with what is believed to be an earlier water feed pipe in the bottom. The image right shows the new well top stiing on the top of the well wall tanks the wood is double thick decking board with a cross braces. "The pump don’t work . . . ’cause the vandals took the handles" well they broke the handle! but if it doesn't work it is most likely because it needs priming. This type of pump need priming with water to work. To prime the pump you simply remove the top section of plastic pipe by gently rocking it while pulling upwards, the pipe work is not glued but just pushed together, when the top is off pour water from the glass R.Whites lemonade bottom left by the dip tank until water flows out of the top, then refill the glass bottle with more water. Now start pumping the water with the handle back and forth. After a few moments you should start to feel the handle become stiffer and this is a sign you are drawing up water from the well, if you don't feel this continue to pour more water down the top while you move the handle back and forth. A some point water will flow out of the top, then you can stop and re connect the top plastic pipe and pump to fill the dip tank. 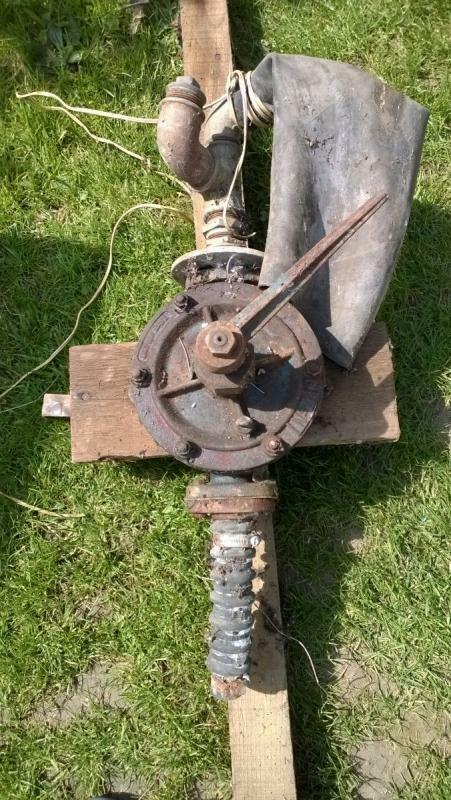 This pump is most likely from the 1950's or even slightly earlier, it is a little worn and need a bit of care and attention to work correctly. It has a curious habit of liking the handle to be at 10 o'clock (to the left) i assume the valves have a lighter seal on that side, so i recommend always leaving the handle in the 10 o'clock position. Below is the well as completed in 2014, with the handle in the 10 o'clock position. Over the past couple of days I've been using the pump on 164 to water the new grass we put down, and whilst there are fewer pumps than taps (so a bit more walking) there's something very pleasing about putting in a bit of effort to draw the water. It's been great to see other members using the pumps too. A great stop-gap between the start of growing season and the end of frost-danger period (when the piped water is turned on). I showed my (6 1/2 yr old) kids too... I don't think they accepted I was serious when I said this was what people used to have to do to get water! But then I thought, where else would kids see this sort of 'technology' still working (in use or not). Whether in a city, town or village, I doubt there are many places.